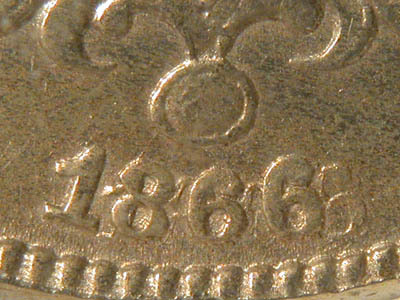 In the first year of issue for the shield nickel, this 1866 starts off the Top 20 list with a nod for most dramatic repunched date in the series. The variety has long been recognized - it appears in Breen as BR2462. The repunching is so dramatic that this coin is often called the 11886666 variety. 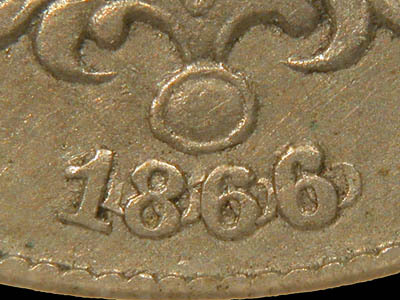 This 1866 could well be described as the sister of the above 1866. The repunching is equivalently dramatic. Where the winner is repunched to the southeast, the runner up is repunched to the northeast. This variety has long been recognized as well and appears in Breen as BR2461. This coin loses top billing only because the winner has the cooler nickname (11886666).